Corsica may technically be the southernmost region of France, but it’s a world apart from the cosmopolitan splendor of Paris and the laid-back luxury of the Riviera. This rocky island has its own language, its own flora and fauna, and a cultural history unlike any other region in Europe. Corsica is sun-baked and sea-shocked, with an understandable chip on its shoulder: after all, it was somehow sold to France by the Italian state of Genoa in the 18th century, even after enjoying 14 years of national independence from any neighbouring land mass. The strained relationship with France and geographical distance has helped to limit tourism and preserve its uniquely rugged terrain, but intrepid travelers who venture into Corsica are rewarded with truly delightful sites, including these seven highlights. 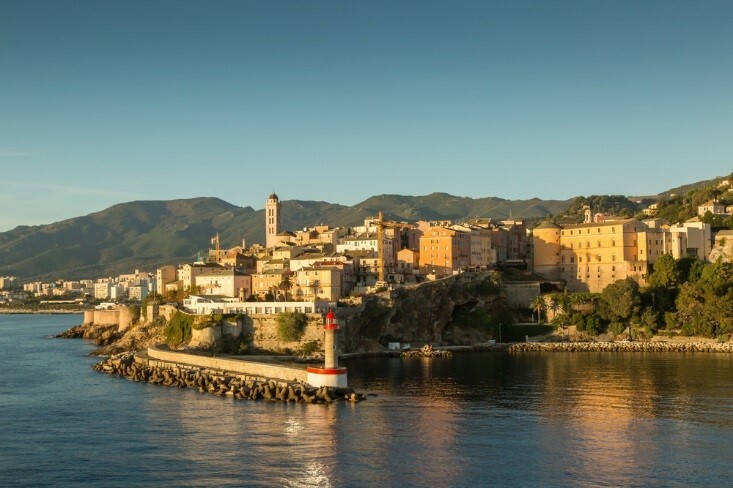 Embodying the lively and colorful north coast of Corsica, Bastia is a busy port and seaside community that celebrates traditional Mediterranean culture. The Place St-Nicolas, adjacent to the wharf, makes a good jumping off point, where you can spy ferries coming and going from all directions. Bastia has more than its fair share of churches, from the ornate 18th century Chapelle de l’Immaculée Conception to the Rococo Chapelle Sainte-Croix, and the 15th century Sainte-Marie, with its solid silver statue of the Virgin Mary. When you’re on your way out of town, be sure to stop into the botanical Parc de Saleccia for a stroll through a stunning selection of native Corsican flowers and trees. 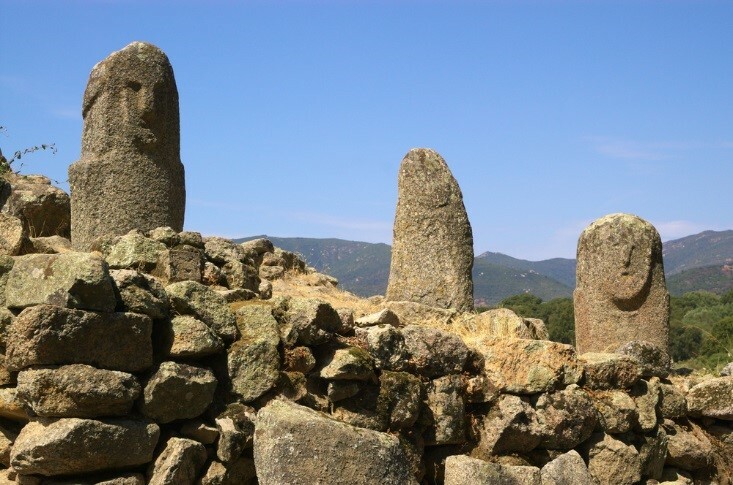 Once you set foot on Corsica’s rugged, windswept scrubland, it’s easy to imagine a prehistoric past, but Filitosa is one of the only places that betray the island’s megalithic roots. Here you’ll see the 4000 year-old stone statues: carved menhirs etched with human features and an interesting array of accessories, like shields and armor. There are several pieces worth visiting, but the most sophisticated specimens stand around a 1000 year old olive tree in the middle of a field – an image that could be ripped from the pages of a storybook. The site is on Corsica’s west coast, aptly removed from the nearby centers of civilization. Les Calanques is one of Corsica’s most revered sights – indeed, one of the most remarkable vistas of any Mediterranean coastal town. Starting just outside of the town of Porto, these stunning red granite cliffs rise up 300 meters (or rather plunge down that distance into the sea below) and are only accessible by foot or boat. As the daylight turns to twilight, the colors play on the rock formations in mesmerizing ways, and the luckiest visitors will catch the show at sunset, when everything is brilliantly lit up. There are several trails that lead you through the landscape, and most start just north of the town of Piana. 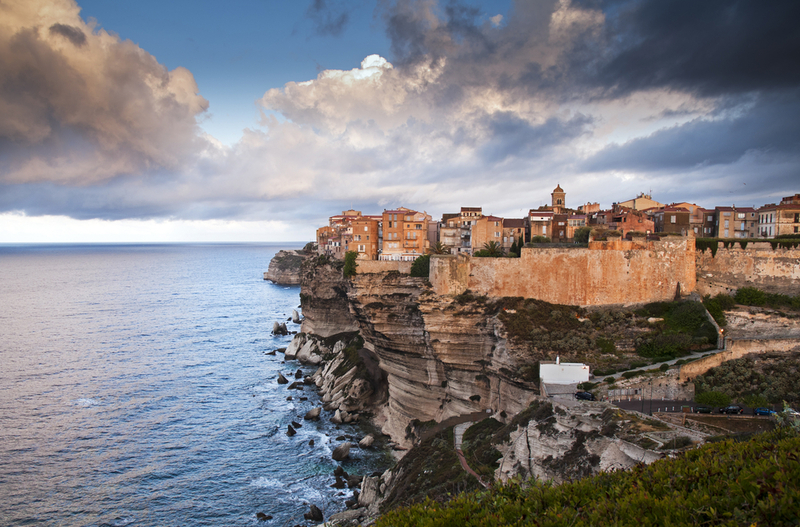 This southern Corsican town offers a lively and happy harbour backed by stark limestone cliffs that stand bright white against the choppy blue waters of the Mediterranean. Steps lead up from the harbor to the fortified Old Town, where the 13th century citadel still stands along with some sleepy residential streets that once housed the majority of the city’s population. To the side of the walled town you’ll find a few old windmills and a crumbling Franciscan monastery that hint at the town’s quiet, rural history. The harbor front is where to go for beach culture, authentic brasserie fare, or a ferry ride to Sardinia (which will take less than an hour). The town where the Emperor Napoleon Bonaparte was born and raised is also the capital of Corsica, and visibly proud of its most famous resident. Every year on August 15th, Ajaccio celebrates Napoleon’s birthday with a city-wide festival; on any other day of the year, visitors can get their fill of Napoleonic history in the 16th century Cathédrale Notre-Dame de la Misericorde (the site of the emperor’s baptism), and Maison Bonaparte, Napoleon’s childhood home that’s now a museum housing relics of his early years. The Palace Fesch is just as impressive as any of Ajaccio’s Napoleonic attractions, with the most elaborate collection of Italian primitive art in Europe (next to the Louvre). The town, like most Corsican destinations, also has a lovely marina, guarded by a 16th century citadel. There isn’t a whole lot going on in the east of the island, but The Castagniccia is well worth driving through. This beautiful, sprawling chestnut grove (planted by the Genoese in the 17th century) is more than meets the eye: it was here that the national hero Pasquale Paoli was born, and later led the fierce revolts against Genoa and France to earn and preserve Corsican independence. Just a few centuries ago, The Castagniccia was the heart of Corsican society and industry, but today it’s a sleepy swatch of lush landscape with picturesque but underpopulated villages. The heavily fortified remains and rocky landscape that cradle most Corsican cities can get a bit wearisome, and that’s when you’ll want to find a sunny beach and quiet coastline. 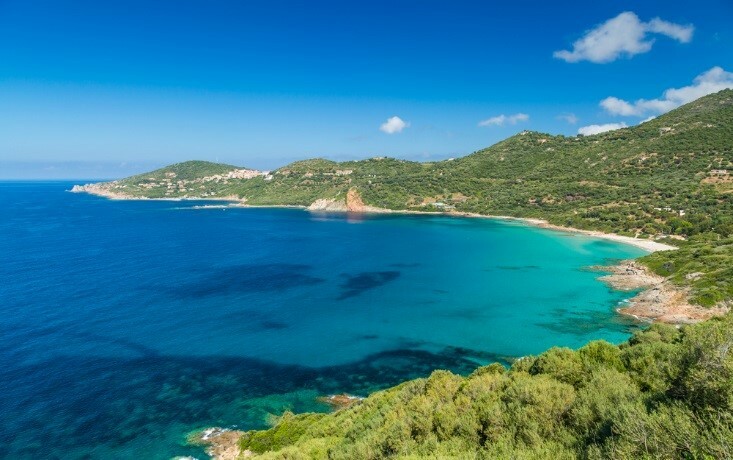 Try Cargèse, a quirky little town on the west coast with a strong Greek heritage (stretching back to 17th century refugees that fled Turkish rule) and a selection of beautiful beaches. Pero to the north and Stagnoli to the south are good choices for a bit of sun and relaxation, and the two churches that face each other – one Greek, the other Corsican Catholic – offer a slightly different backdrop than other seaside towns on the island. 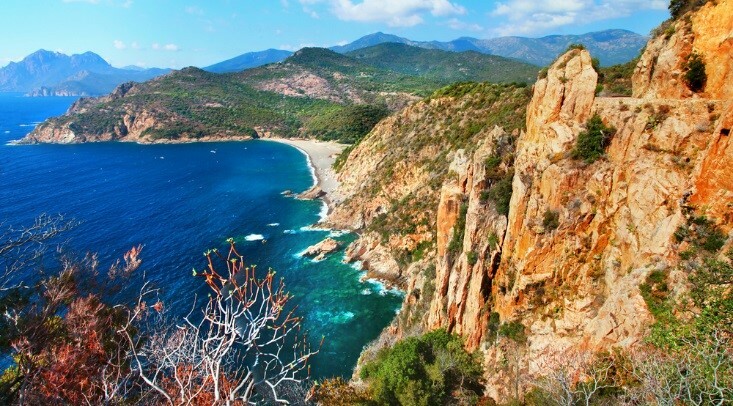 Corsica isn’t a particularly large island, but the rugged terrain and noticeable lack of public transportation make a rental car a necessity is you want to explore beyond the main port towns. 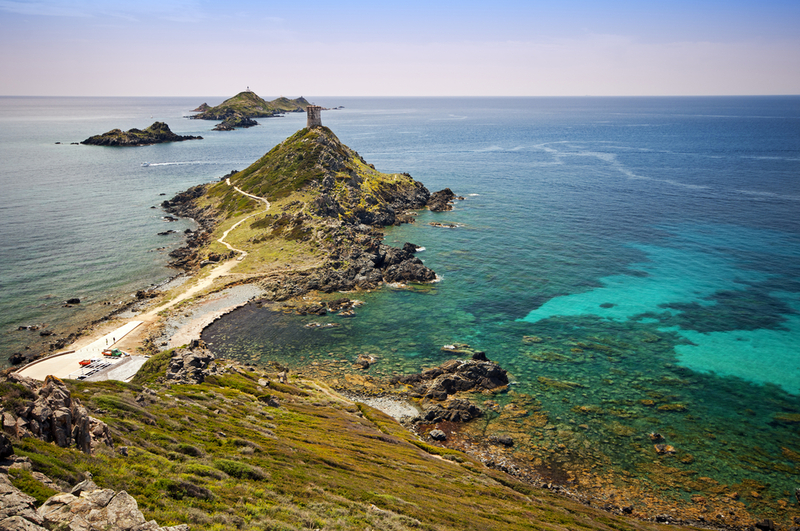 Luckily, the ferries from France can bring your car along with you, which will make things a lot easier once you alight on Corsica’s rocky roads.